The watch industry was impressed in 1996 when Chopard first debuted its L.U.C caliber, followed a year later by L.U.C 1860, Chopard’s first L.U.C watch. Well known for its jeweled timepieces, nice dress watches for men and its Mille Miglia sports models, Chopard at that time was not yet known for watch movement manufacturing. Because very few watch firms made in-house movements, Chopard’s reliance on supplied movements was not at all unusual at that time. 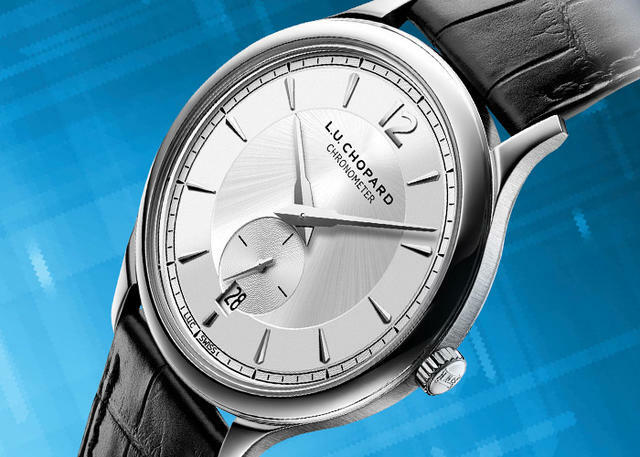 So when Chopard debuted its L.U.C collection to join that small group of Swiss watch manufacturers, the introduction marked a turning point in the firm’s long history. Chopard’s Karl-Friederich Scheufele (who shares the presidency with his sister Caroline Scheufele) had big plans for the jewelry and watch firm founded in 1860 by Louis-Ulysse Chopard. By the 1990s, Scheufele knew that to reach the high level of control and quality already seen at Chopard’s extensive jewelry making facilities in Geneva, he needed to develop a deeper, more reliable and internally controllable source for movements used in its relatively new men’s watch collections. 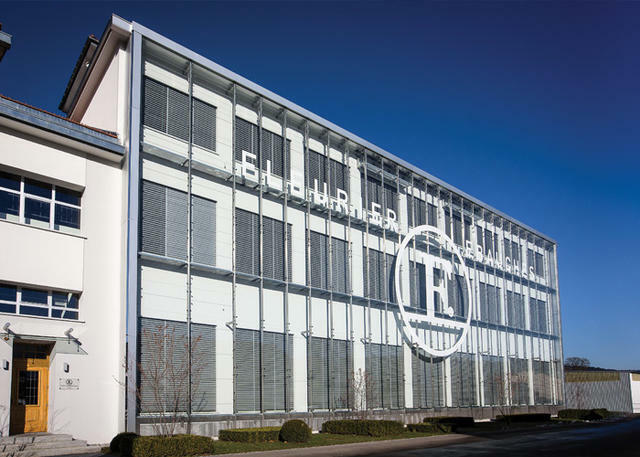 Scheufele met the challenge head-on in 1994 when Chopard broke ground in Fleurier Switzerland, on what would become the firm’s state-of-the-art manufacturing facility. A few years later, the Chopard manufacture unveiled that first in-house movement, L.U.C 1.96-L, with initials that were a nod to company founder Louis-Ulysse Chopard. Scheufele’s instincts proved correct as accolades rolled in from those within the watch industry as well as from collectors. Later that year, that L.U.C 1860 watch, housing that premiere movement, was voted “Watch of the Year” by Montres Passion magazine. 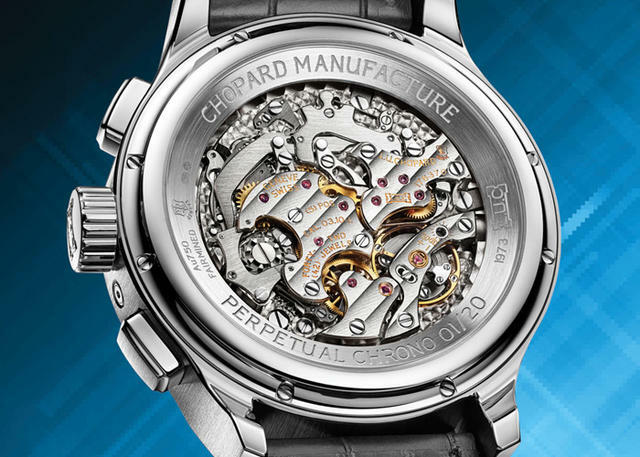 Chopard opened its Fleurier Ébauches in 2008 to develop additional calibers. In the two decades since that auspicious debut, Chopard’s L.U.C models have included innovative tourbillons, perpetual calendars, regulators, high-tech repeaters and a chronograph. All feature chronometer certification, extended power reserves and, very often, Geneva Seal finishes. As a founding partner of the stringent Qualité Fleurier seal that tests fully cased watches, Chopard also has manufactured many L.U.C timepieces that have passed this highly esteemed set of technical hurdles. 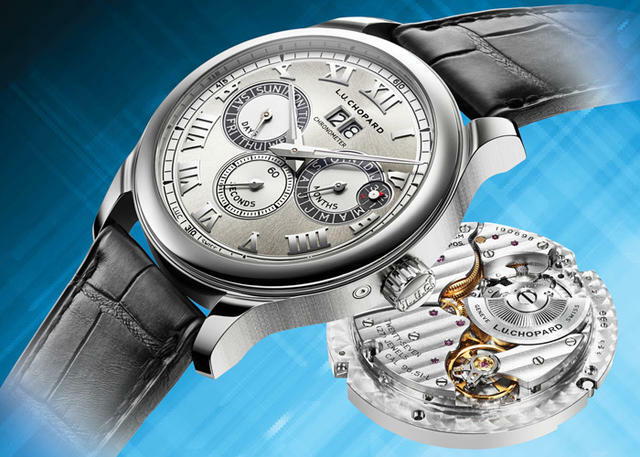 Created in 2001, the Fleurier Quality Foundation, which administers the tests, was a joint project undertaken by the Chopard, Parmigiani Fleurier and Bovet Fleurier brands, as well as the Vaucher Manufacture Fleurier, to establish new aesthetic an technical criteria dedicated to the certification of finished watches. Since its debut two decades ago, Chopard’s L.U.C collection has attracted watch aficionados who prefer in-house development and manufacturing. As successful as Chopard’s Happy Diamonds and its Mille Miglia sports watch collections had been prior to L.U.C, the firm’s reliance on supplied movement manufacturing for these collections and for its gold men’s dress watches had many of these high-level buyers searching elsewhere. Karl-Friederich Scheufele continued to move Chopard toward total vertical manufacturing following his success with the L.U.C facilities. He again enhanced Chopard’s in-house direction when he and the company opened Fleurier Ébauches in 2008 to manufacture additional movements, many of which have been used within Chopard’s high-end sports watch production and within several ladies models. Chopard looked to its experiences with L.U.C: The first calibers from Fleurier Ébauches were developed during the conception phase of the L.U.C. 11 CF chronograph caliber. Just last year the company added its first set of in-house movements to Chopard’s long-running Mille Miglia collection of automotive-inspired timepieces. For the first time, the chronometer and power-reserve Mille Miglia models were equipped with a Chopard movement from the workshops of Fleurier Ébauches. This year Chopard continues to expand its L.U.C legacy with the new L.U.C Perpetual Chrono, the L.U.C Perpetual Twin, the L.U.C XPS 1860 and the artisanal L.U.C 35mm Esprit de Fleurier Peony. The new Chopard L.U.C Perpetual Chrono combines two of watchmaking’s most challenging complications. 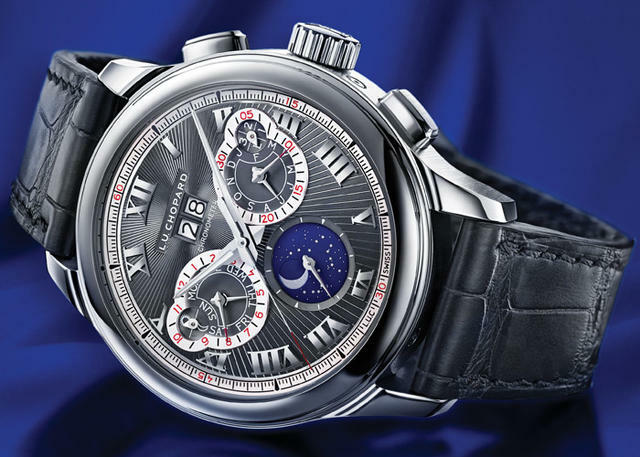 This watch features Chopard’s impressive column-wheel hand-wound chronograph with vertical clutch, which it originally debuted just a few years ago in the L.U.C 1963 Chronograph, and adds Chopard’s own perpetual calendar to create a combination only attempted by watchmaking’s top-tier makers. The complication essentially combines two time frames: a long-term calendar accurate for centuries and the shorter stopwatch function to time very specific events. The manual-wind L.U.C Caliber 03.10-L, as noted, utilizes a column wheel to control its chronograph functions, including its flyback operations. As with so many superior chronographs, this caliber (seen at right) also uses a vertical coupling clutch to smooth its pusher activation. On the dial, chronograph indication is indicated in red to separate it from the various calendar indications that also share dial space at 3 o’clock and 9 o’clock. This sharing of space also gave Chopard license to design novel displays for the leap year and the day/night indicator. The perpetual calendar itself includes a large twin-aperture date display, indications of the day, month and the above-noted leap year subdial. Further indications include the novel day/night display and a rich blue orbital moon phase that shows an exceptionally accurate reading for the age of the moon, with a reported one-day deviation in 122 years. Not only does the L.U.C Perpetual Chrono combine two of watchmaking’s most challenging complications, it does so with the written approval of excellence of the two top certification agencies: the watch is a Contrôle Officiel Suisse des Chronomètres (COSC) certified chronometer and is stamped with the Poinçon de Genève, known as the Geneva Seal. The 45 mm case of the L.U.C Perpetual Chrono is entirely made of “Fairmined” 18-karat white gold or rose gold, sourced from ethically sensitive Fairmined certified mining cooperatives. This 43mm steel-cased, chronometer-certified perpetual calendar features the day, date and year indicators found in the Perpetual Chrono, but without the event-timing chronograph, moonphase indicator, day/night dial and the precious metal case of that limited edition. The result is a contemporary perpetual calendar with all the quality and design characteristics Chopard builds into each watch within its premier-level L.U.C collection. The Perpetual Twin dial is easy to read on its silver-toned sunburst pattern, especially given its blue date and month subdials and large date. Chopard’s micro-rotor and two barrels, which comprise the brand’s patented Twin technology, combine at the heart of brand new caliber 96.51-L, which supplies the watch with a comfortable 58-hour power reserve. All the watch’s components are hand-beveled. Chopard’s L.U.C collection celebration reaches back to its first model, the L.U.C 1860, which this slightly larger 2016 model reprises. The 40mm L.U.C XPS 1860 comes in a choice of a steel-cased model or a limited edition rose gold model. Like the original, the new watch remains an elegant, thin (7.2mm) and dressy design with a central hand-guilloché motif on the rose gold version and a sunburst satin-brushed pattern on the stainless steel version. This L.U.C XPS 1860, like its forebear, is one of the few thin watches to display the date. Inside the gold model is Caliber L.U.C 96.01-L (with Poinçon de Genève quality hallmark), a caliber with a gold micro-rotor and 65-hour power reserve that was well ahead of its time when it debuted two decades ago. Chopard places L.U.C 96.03-L inside the steel version. in 2014, Chopard created a feminine-styled L.U.C watch with a 35mm diameter. A year later Chopard added Fleurisanne engraving to the collection. This artisanal work, a specialty of the village of Fleurier, contributed to the reputation of local 19th century watchmakers, adding appeal to the locally produced time-pieces that were in demand across the globe, and especially in China. In brief, Fleurisanne engraving is distinguished by its motifs carved in high relief. The engraver cuts away the surrounding metal to leave a particular pattern. The raised surface is then engraved with a scrolling pattern known as ‘volutes’ or with flowers, and then polished. The background is hammer-stippled to give it a grainy effect. The new L.U.C 35mm Esprit de Fleurier Peony (below, right) features a peony motif and is fitted with a brushed pink canvas strap. Both the movement and the dial have been adorned with an artistic peony, a flower long considered good luck and an indicator of wealth and honor. On the gold dial Chopard artisans have placed a layer of Tahitian mother-of pearl, which is then meticulously cut and filled with gold and diamonds in the shapes of the peony. 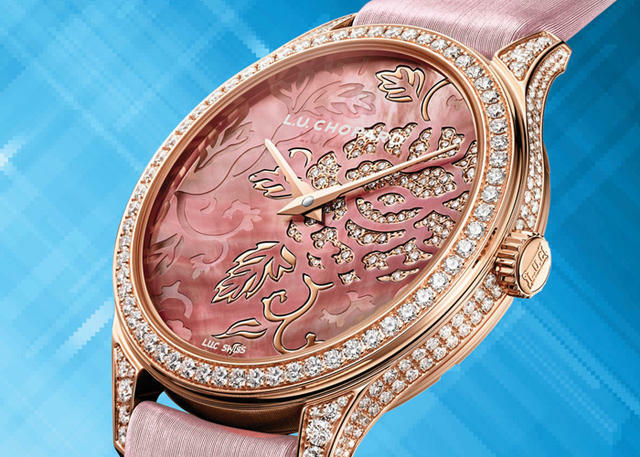 The rose gold movement, Caliber L.U.C 96.23-L, is visible from the caseback and adorned with the peony motif according to the Fleurisanne engraving technique. Its surface is engraved with scrolling patterns or flowers and then polished while the base surrounding the peonies is stippled dot by dot to create a grainy effect. This process takes one-and-a-half weeks to complete for each movement. After engraving, the movement is rhodium-coated to achieve an unusual two-tone appearance. The watch is made in an eight-piece limited series and is a boutique edition. These debuts, and the L.U.C legacy, was a primary focus for the brand at this year’s Baselworld, though Chopard also expanded its Mille Miglia collection, added a Superfast Porsche Motorsport 919 model and bolstered its well-known Happy Diamonds and Happy Sport watch lines. 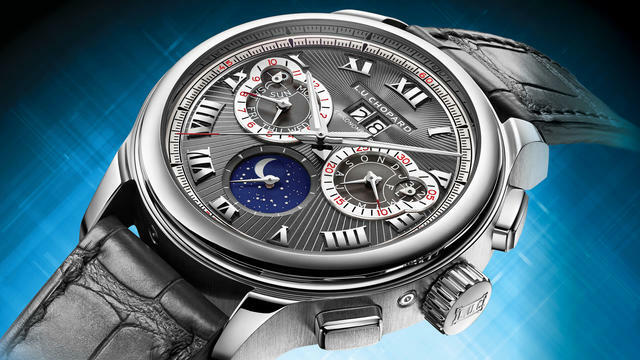 See more about Chopard here or Chopard.com for additional details about these new models.